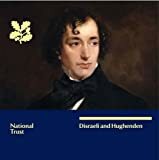 Hughenden Manor offers a vivid insight into the charismatic personality and colorful private life of the most unlikely Victorian Prime Minister, Benjamin Disraeli, who lived here from 1848 to 1881. The formal garden has been recreated based on the original designs of Mary Anne Disraeli and there are beautiful woodland walks surrounding this fascinating country home. Sally Stafford is the National Trust’s former Learning and Interpretation Officer responsible for Hughenden.